Opening hours: Most shopping centres open daily from 10am to 9:30pm. Government offices are open Mon-Thu and Sat 7:45am-12:15pm and 1:30pm-4:30pm (closing on Fridays and Sundays), while private offices and businesses generally open 8am-5pm on weekdays and 8am-12pm on Saturdays. Banks operate 9am-3pm on weekdays and 9am-11am on Saturdays. Note that abbreviated schedules apply during Ramadan. 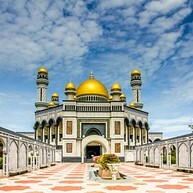 Bandar Seri Begawan's numerous spectacular mosques and palaces constitute some of the city's major draws. They match elegant simplicity with over-the-top luxury that makes them a sight to behold. But BSB offers more than just lavish buildings to be admired. The city boasts some great museums and attractions, and the floating city of Kampong Ayer is well worth a visit. A perfect blend of old and new, the Omar Ali Saifuddien Mosque combines the Mughal and Italian architectural styles and shows off exactly what Brunei lavishness is all about, with marble, chandeliers and luxurious carpets imported from around the world. It is also the tallest structure in BSB, the sultan forbidding any building to exceed its height. It is a beautiful building and the centre of cultural life in the city. 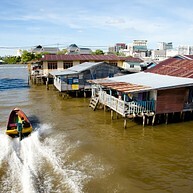 This amazing agglomeration of stilt villages in the middle of the Brunei river dates back at least one thousand years and is home to as many as 30,000 residents. A city unto itself, Kampong Ayerm once dubbed the "Venice of the East," has its own schools, mosques and infrastructure, and a visit here is a truly unique experience. Istana Nurul Iman is the official residence of the sultan of Brunei, and is reportedly the largest residential palace in the world, over four times the size of the Versailles Palace, with some truly staggering numbers: 1,788 rooms, 257 bathrooms, a banquet hall for 5,000 guests, a mosque for1,500 people, a 110-car garage, a stable for 200 ponies, 5 swimming pools, 564 chandeliers, 51,000 light bulbs, 44 stairwells, and 18 elevators. It is best viewed from a water taxi, as it cannot be entered except during a special yearly festival. 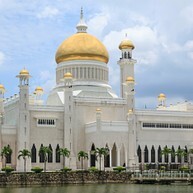 Located about 3 km from the city centre, and built in honour of the current sultan of Brunei, this mosque, the largest in the country, consistently astonishes visitors with its luxurious design and decor. The 29 golden domes arethe standout features, signifying this sultan as the 29th ruler of his dynasty. This fantastic recreational complex houses a golf course, a polo club, and many other types of entertainment. Visitors can swim in the swimming pool or go horseback riding, enjoy some fine dining, or spend the evening at the Jerudong Park Playground seeking thrills on the many rides of on the go-kart track. 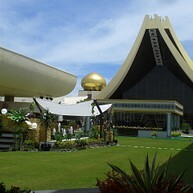 Brunei's National Museum showcases the country's rich history through exhibits that include a wealth of Islamic art and artifacts dating back over one thousand years, among which visitors can find manuscripts of the Koran, gold jewellery and Brunei's ceremonial cannons.